Duisburg/Hamburg, September 24th, 2018 – Imperial Logistics International has been named “Best European Warehouse Supplier 2018” by Versum Materials, a leading electronic materials company providing high-purity chemicals and gases, delivery systems, services and materials expertise. 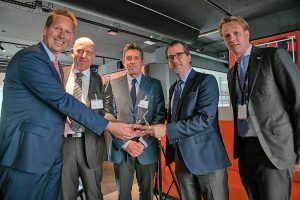 The annual award was presented at the recent opening of Versum Materials’ new European regional headquarters in Utrecht in the Netherlands. Imperial Logistics International was recognised for its warehousing management expertise and superior technical competencies in safely storing and shipping Versum Materials’ gas cylinders from its gas warehouse at the port of Hamburg. The gas cylinders are stored in separate high-security chambers at the dangerous goods warehouse operated by Imperial Logistics International. These specialised warehouse chambers – which are isolated from one another and from other parts of the warehouse – are strictly operated in adherence with the exacting requirements of pollution control laws. Sophisticated measurement and control technology effectively coordinates a myriad of technical safety measures. These include sensitive gas warning sensors, permanent air measurements and highly efficient absorption units. Should a leak occur, absorption units rapidly filter the escaping gas from the air and ensure that only uncontaminated waste air is fed back into the atmosphere. “State-of-the-art equipment, progressive problem solving and an unrelentingly thorough approach to safety are just some of the reasons we were honoured above other fierce competitors in this category,” explains Michael Pohl, Director Chemicals Business Unit, Imperial Logistics International.